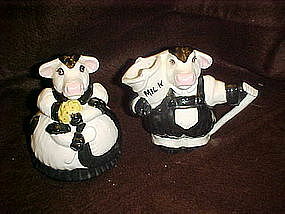 Cute creamer and sugar set of the black and white dairy cows. He holds a bucket of milk and a rake, and she has a spoon and a bouquet of flowers. Measures 4 1/4" tall. Sugar bowl is perfect. Creamer has a chip off the edge of the bucket (on white area) and a chip off the underside of the rake (white area). Not very noticeable unless you closely look at it. Made of heavy ceramic and has a nice heavy glaze, no cold paint. See the other pieces I have to match in my catalog.